Jacob Perry is not only making a name for himself at The New London Waterford Speedbowl, but he's turning into one very busy driver as well. 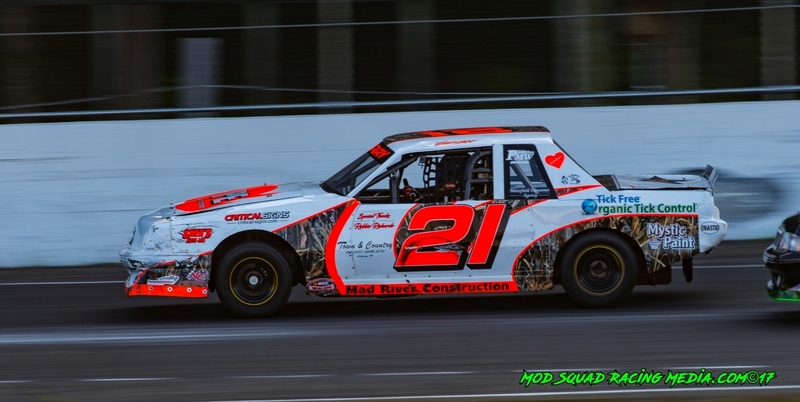 The Pawcatuck, CT resident is entering his second season in the Mini Stock Division and as of late has entered his family owned (Norm Perry) SK Modified to his NLWS resume. If that's not enough the Pro-4 Modifieds are running a four race Connecticut Championship Series at The Speedbowl where Perry is entered in a Mark Charette owned Pro-4 Lite Modified, so race day is a pretty busy place for the fifteen year-old. Talking with Perry about getting into three different types of cars in one night, what would be his biggest challenge? The answer he gave me was a little shocking, Power Steering. The Mini-Stock and his Pro-4 Modified, neither has power steering so when he gets into the modified it takes a little adjusting on his part to get use to it. The wins started to rack up quickly and sat in Victory Lane at eight different race tracks through out his career (NHMS, Star, Lee, Waterford, Thompson, Little T, Bethel and Monadnock). With the wins came the awards, such awards being a 4-Time Inex State Champion, 2016 NASCAR Whelen Rookie of the Year and taking the 2016 UNOH Youth Award just to name a few. On a bigger scale Perry finished in the top-25 NASCAR National 4 Division. So to say Perry is on his way is just an understatement, just look at what Perry has chalked up in such a short period of time. To say its a family affair for Perry is a understatement, just stop by his pits and its like a Perry family reunion. Norm, Dennis (Father), Cheryl (Mother), Roger (Grandfather), Wendy (Grandmother) and Shelly Perry. Joining the group in the pits are George Wilkinson, Jesse Hunt and CJ Botelho. Perry has very unique paint schemes for his cars. 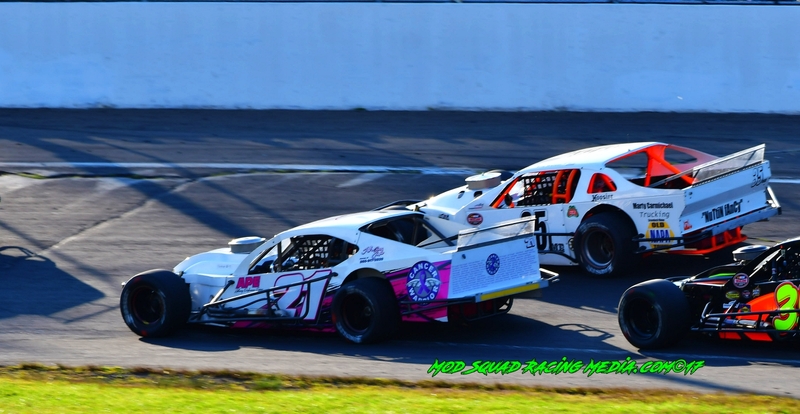 First the Mini Stock is painted with a former Kevin Harvick paint scheme (White, Fluorescent Orange and Camouflage), the Pro-4 Modified is painted all black with yellow numbers and the SK Modified is White, Pink and Black, which he dedicates to all Cancer Survivors. Another unique item for Perry is that all his cars are numbered #21. The reasoning behind that was just watching his dad growing up racing the #21 and just liked the number and continued the family tradition. One thing Perry has going into the 2017 season is a strong series of sponsors helping out. APE, Tick Free Organic Tick Control, Mad River Construction, Shea's Auto Body, Critical Signs, The Racing Guys, PMW Marine, Mystic Paint, Town and Country, Schilke Realty and Jeff's Custom Graffix. Away from the track the 15-year-old has a full plate. 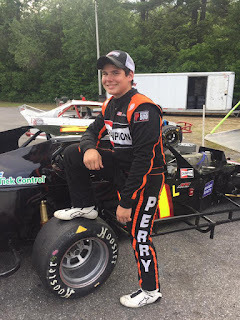 Beside going into his Sophomore year at Stonington High School, Perry could be found around cars, either detailing them (Valenti Auto Mall in Westerly) or working on a different type of car, a race car. On race day there is two rules that Jacob follows, no green clothing and he has to listen to "God Bless Saturday" by Kid Rock. Perry also wanted his fans to know that he is very approachable and loves his fans. If you have a chance to talk to Jacob he's very down to earth and well respected by many. There was a Facebook picture a few weeks back that earned a lot of likes, Perry had his hand on his heart during the National Anthem while buckled up in his Mini-Stock. No matter if it's talking in person or over the phone, Perry will always show you the respect you deserve. That's just the way Perry is. Perry wants to be where every up and coming driver want his career path to end up, one of the three NASCAR's premiere divisions. One thing that Perry would like to change if he could is picking talent over money in racing, But that choir is little to slim to get around. There is only a handful of drivers that has the raw talent that Perry has. No matter what car he is driving at the time, look for him towards the front or even battling for the lead, he's that kind of driver. You can connect with Jacob on any Social Media platform.